On 15 August 2018, the North-West University (NWU) formally constituted the Unit for Continuing Education (UCE) Business Development Forum (BDF). The forum is the brainchild of Prof Robert Balfour, the deputy vice-chancellor for teaching and learning. It was established in response to the NWU Council’s call to grow the UCE to become a profitable unit that can mitigate the impact of the loss of income as a result of diminishing state funding support. The BDF aims to drive business development activities across the university stakeholder community and to increase income stream three revenue generation. This will lead to increased profitability and ultimately achieve fiscal sustainability. “In order to achieve the full buy-in for effective implementation of the business development strategy, the BDF will engage in further consultation to reach out to as many academic and support staff members as possible,” he says. Dr Sazi concludes that the active participation and incisive contributions of BDF members during the meeting represents a clear reflection of their strong and collective commitment to make the forum a phenomenal success. Dr Aaron Tshidzumba, deputy dean for community engagement and stakeholder relations at the Faculty of Humanities, was elected as chairperson. 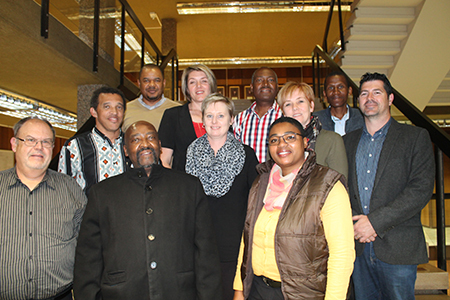 Prof Ronel Pretorius, associate professor and manager of the Clinical Education programme at the Faculty of Health Sciences, was elected as deputy chairperson. These are the members of the Business Development Forum that was constituted on 15 August 2018.